We have learned over time that the running back position is without question the most volatile in fantasy football. 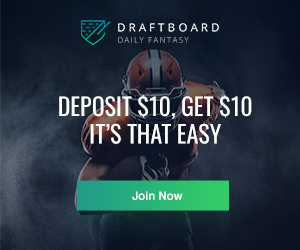 This understanding is based upon the percentage of injuries versus the other skilled positions, NFL teams increasingly using split back committees, and also takes into account weekly fantasy scoring consistency. Along with this natural order of chaos, the general fantasy football playing public often assumes that handcuffing work horses with the next man up on their primary back's own team depth chart is the only viable strategy on draft day. While the traditional handcuffing strategy can work in some unique situations around the NFL (detailed below), it is highly unreliable in most due to various factors such as the inexperience or ineptitude of the RB2 on a team's depth chart. 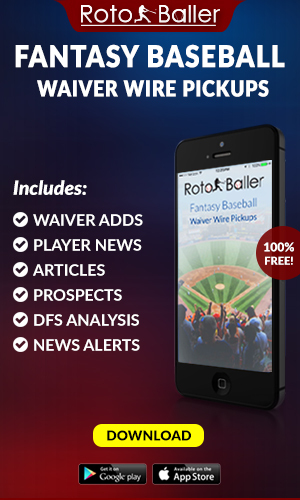 Unfortunately, the traditional handcuffing strategy has become a lazy form of oversimplified analysis by too many drafters and experts doling out fantasy advice to their patrons. 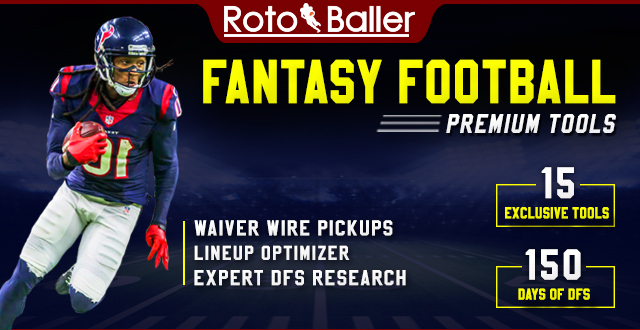 We are setting out to change that mindset and rebrand the definition of what a running back handcuff could truly be for your fantasy football team. 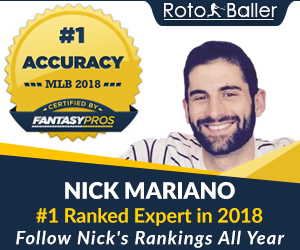 The New Running Back "Handcuff"
By analyzing the current fantasy football preseason drafting trends via average ADP, and comparing them to the RotoBaller staff rankings in an attempt to unearth dark horse running back production upside, we can make some compelling cases to dispel the traditional handcuff strategy in favor of the upstart "handcuff hedge" theory. 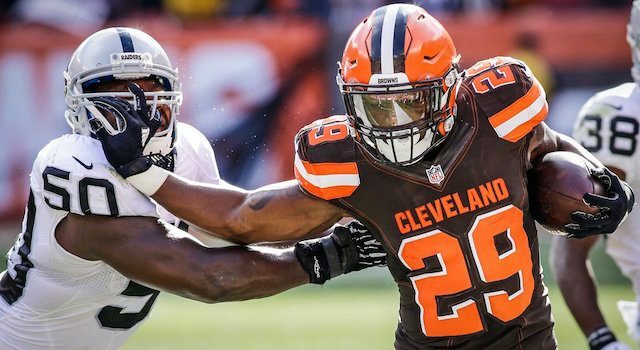 You no longer should have to look for a backup to your stud running back from the same NFL team when there are so many better upside options elsewhere around the league, that will be arguably be more productive in case of emergency, but will also have standalone value week to week on your fantasy football roster. This article will break down the tiers of handcuff hedges based on the severity of player valuations, and the need to employ the strategy in each unique NFL team's running back situation. The first block will only include the instances where we advocate the traditional handcuffing strategy, while tiers 1-3 will highlight the best uses of handcuff hedging. The main factor to take into account is that we are trying to achieve the best possible draft capital value for our handcuff hedges (defined as an average ADP delta of 50 or more slots), while only recommending "handcuff hedges" that have some level of stand-alone roles as projected secondary or pass catching backs in their team's offense. This exercise is based around point per reception (PPR) scoring formats and the theory is best applied to those league types. It is also important to mention that we are not taking potential future injuries into account; since we cannot predict the future, we project production and viability for a 16 game sample size. Even though there are many deeply rooted personal biases regarding the running backs I will target heavily, and those that should be avoided at all costs during a fantasy football draft, it was still important to get just about every projected starter (minus a few exceptions like Jonathan Stewart who does not need a handcuff because he's already a late round value pick) into these tiers. Remember that all of the "ideal handcuff hedge" running backs were chosen because they will have a projected stand alone role in their team's offense, as a 3rd down pass-catching back or goal line specialist, at the very minimum. It also goes without saying that some of these players may not pan out as viable fantasy football contributors this year, as it happens every season, but this entire article is based on the actual player valuations that the masses have assigned to these running backs based on current average ADP. While it was tempting to use rookies with upward mobility such as D'Onta Foreman, Samaje Perine, Jamaal Williams, De'Angelo Henderson, Joe Williams, Marlon Mack or Alvin Kamara in this article, the reality is that as of the start of Week 2 in the NFL preseason, none are close to having a guaranteed role in their team's offense (although I personally do love the upside of a few of them for the 2017 season). Damien Williams - This kid showed he was a viable NFL running back in 2016, even in a limited role for Miami. We love his speed (4.45 40-yard dash) and production premium metric a lot. He has standalone value as the Dolphins 3rd down back and could have a large role if something were to happen to Jay Ajayi. That being said, you can still draft him alongside our listed "ideal handcuff hedge" Theo Riddick in the 28th round; mostly a best ball league target draft pick. He would also be the first player off the waiver wire in the case of Ajayi going down with an injury. If you have any further questions about the "handcuff hedge" theory after reading this article, or anything relating to fantasy football, feel free to hit me up on twitter @RealTalkRaph or book a premium expert chat session at anytime. 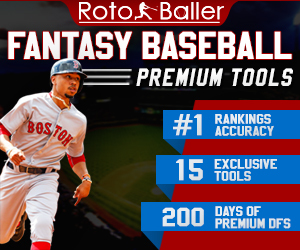 Our goal at RotoBaller.com is to help you get an edge on the competition, and increase your opportunity to win playing fantasy football in 2017.